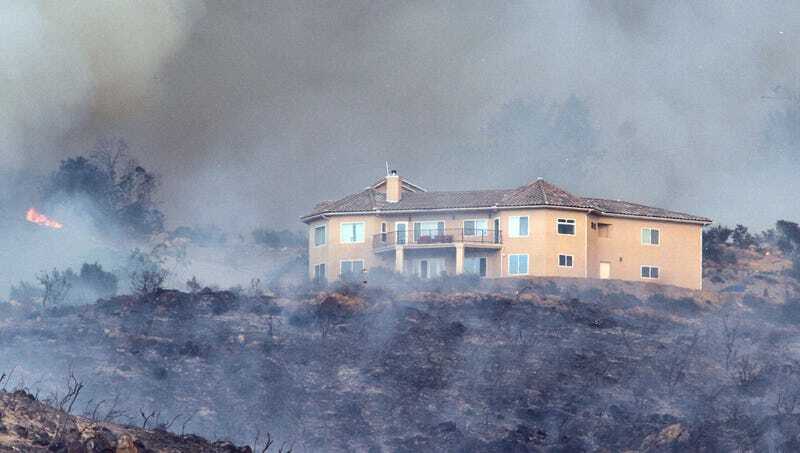 BEL-AIR, CA—Saying the ornamentation was not in compliance with neighborhood guidelines, the Bel-Air Homeowners Association issued a fine Thursday to a resident with an unapproved wildfire in his front yard. “After receiving complaints from neighbors on both sides of the residence, we were left with no choice but to fine Mr. [Michael] Walters for the flames raging in his front lawn,” said association president Linda Heggen, adding that each day the massive blaze was not extinguished would result in additional penalties. “Upon taking possession of their homes, property owners agree to adhere to the strict no-inferno policy. This is an exclusive community, and we can’t allow that to be compromised by someone deciding to keep an obtrusive hundred-foot wall of fire in front of his house.” At press time, however, the homeowners association lifted an existing fine against the resident for overgrown hedges as the wildfire had incinerated them.